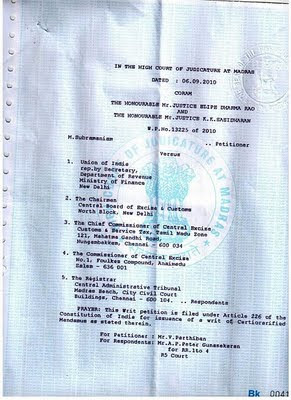 CUSTOMS & CENTRAL EXCISE OFFICER'S BLOG: Good News- Hon’ble Chennai High Court allows the Grade pay of 5400 to ACP Inspectors after 4 years in 4800 gp. 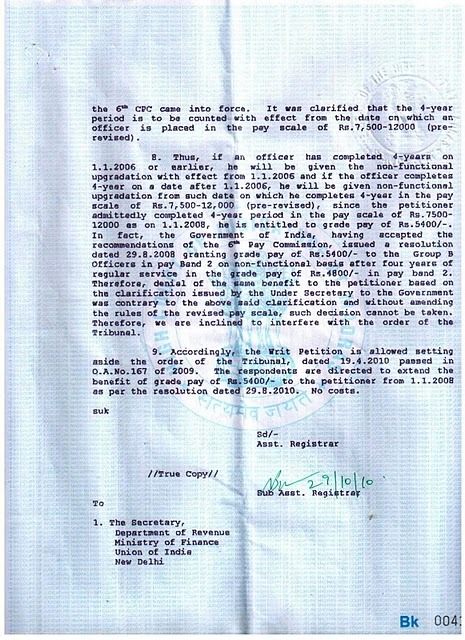 Good News- Hon’ble Chennai High Court allows the Grade pay of 5400 to ACP Inspectors after 4 years in 4800 gp. Friends, we salute to Shri M.Subramanyam, Supdt. of Chennai ( Ex Gen. Secretary of Inspectors Association Salem branch)for his relentless effort to fight for grade pay Rs. 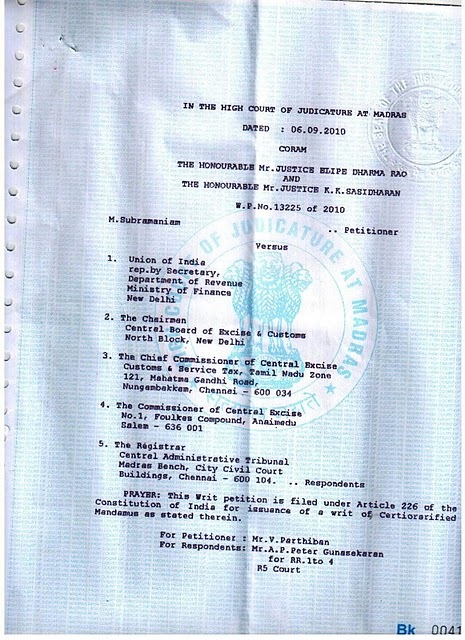 5400 in High Court of Chennai. 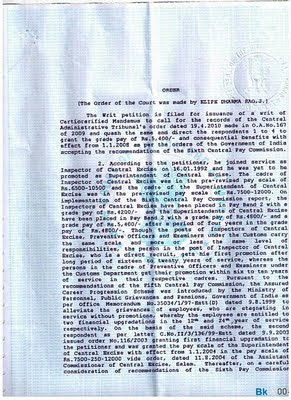 Hon’ble High Court has finally allowed his Writ Petition no. 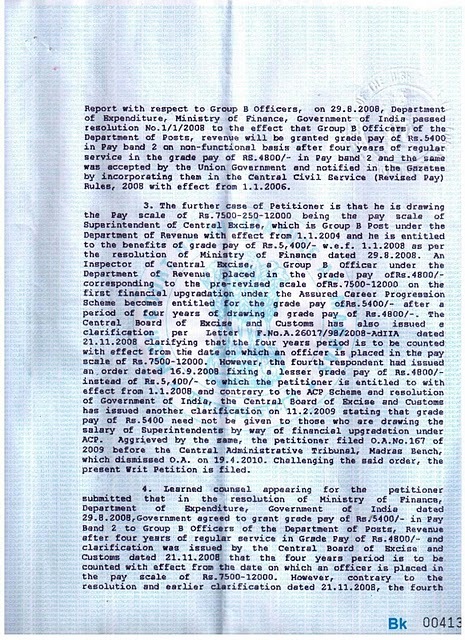 13225/2010 and directed the Revenue Secretary to extend the benefit of grade pay of Rs.5400 to ACP Inspectors after completing four years in grade pay of Rs.4800/-. While deciding the WP no. 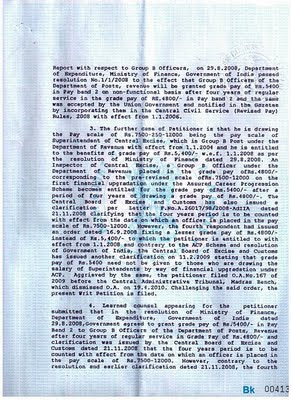 13225/2010, Hon'ble Court held that " In fact, the Government of India having accepted the recommendations of the 6th Pay Commission ,issued a resolution dated 29.08.2008 granting grade pay of Rs.5400/- to the Group B Officers in pay band 2 on non-functional basis after four years of regular service in the grade pay of Rs. 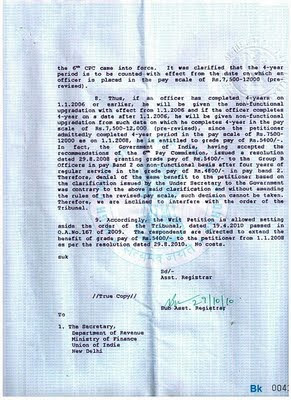 4800/- in pay band 2. 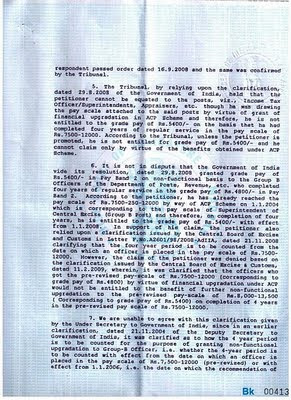 Therefore,denial of the same benefit to the petitioner based on the clarification issued by the under Secretary to the Government was contrary to the above said clarification and without amending the rules of the revised pay scale, such decision cannot be taken. 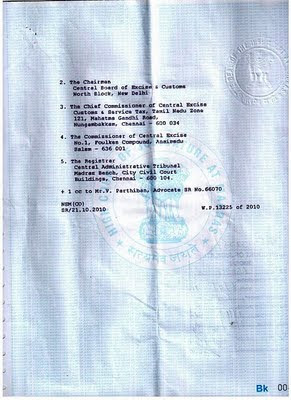 Therefore we are inclined to interfere with the order of the Tribunal. 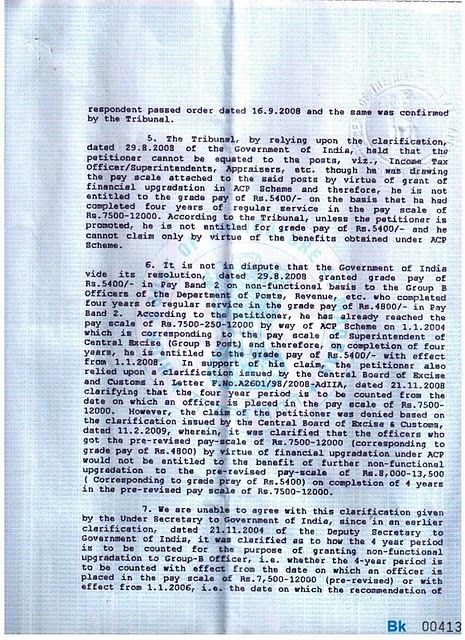 Accordingly, the writ petition is allowed setting aside the order of the Tribunal, dated 19.04.2010 passed in O.A. 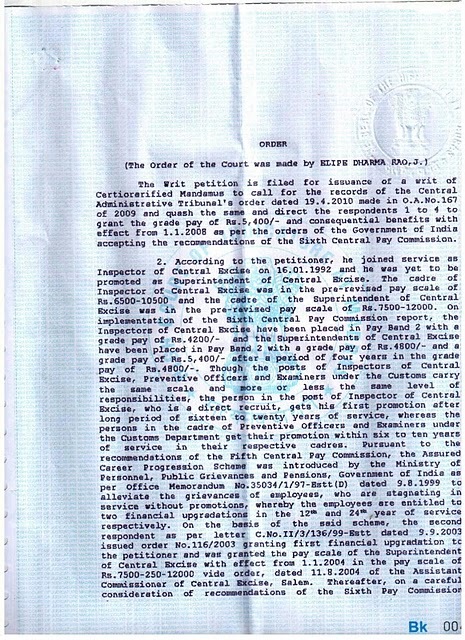 No.167 of 2009.The respondents are directed to extend the benefit of grade pay of Rs.5400/- to the petitioner from 01.01.2008 as per the resolution dated 29.08.2008. No costs". It is a bitter truth that in Rajasthan we are facing acte stagnation, but I am observing that Inspectors of Rajasthan (except few fellows) are not active for their future, which will ultimately result in discrimination with us in the on going Cadre Restructuring -2010. 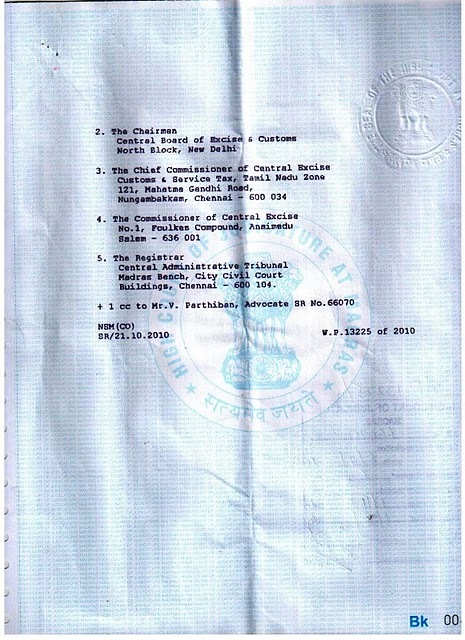 I have published suggestions on regional disparity & proposal for new Customs Commissionerate at Jaipur on the basis of genuine grounds and send the same by e-mails to Mr Awasthi & Mr Tiwari, the key post holders of the Rajasthan Association, but it is to inform all of you that both the said comrades are neither giving any response to my mails nor appears ready to do something positive for us. BOTH THE SAID PERSONS ARE EVEN NOT RECEIVING CALLS TO DISCUSS THE BURNING ISSUES. Is still you expecting any sincere efforts for justice from them. On the issues of common interest there are many responses from other states and All India Associatiion, but I failed to understood the aim of the Inspectors of Rajasthan. Plz note that last date for submission of suggestion/proposal is 20.11.2010. I solicit your attention to the valuable suggestions of Sri B.L. Meena, Inspector, JAIPUR. Sri Meena has rightly pointed out that "(iii)If the present proposals are accepted as it (is now), regional disparity will also increase......". He has also pointed the finger for these disparity on a clan who think they are alien rulers(who ignore the plights of the subjects) from the planet Mars. (a continuation of colonial British legacy, off course exceptions are there). Among the suggestion to cut-off the regional post-restructure huge disparity, "Inter Zone transfer policy can be made on promotion to the grade of Superintendent in adjoining Zones with provision to return in the parental Zone on FIFO method. "- is highly praiseworthy. The junior-most and on, may be asked to opt for their zone of choice in inter-zonal transfer on promotion, without disturbing the ACP/MACP benefits awarded to the unwilling officers. Sri Meena's proposal of "1.The remedy to remove the growing disparity in promotion among cadres of Examiner, PO & CE Inspector lies only in making the date of joining in feeder cadre as criteria for promotion to the next grade. This only can meet the ends of justice and help to remove the disparity once for all." - has to to be implemented and can be implemented only if the administration opt for the policy of "we will see it later on......let us make a very very high supper power committee.....we will do it after the next Govt is formed....it is in the active consideration of the administration...." etc. and leave the comfort zone of indecisiveness(which is also a decision). Also, the present zonal disparity is against the 'Right to equality' given by our Constitution.